Teaching phonics is an essential part of improving both reading and language skills for young students. And, with the screening check on the horizon, we know it’s particularly important to find engaging ways to recap the same content. To help you do just that, we've packed our primary national tests collection with practice questions, games and revision lessons. Here are just a sample of the resources you will find. We created this test to assess our children halfway through the year or for key children, especially those undergoing Reading Recovery. Words can be edited and action taken after analysis of results. A selection of three phonics practice papers to use with your year 1 class in preparation for the screening test. The papers contain original content, but are all based entirely on past papers, progressing from simple cvc phase 3 words to more complex phase 5 words. There is an accompanying PowerPoint presentation with each paper, so that you can choose to work with the whole class or individuals. An answer sheet and tick sheet are also included. Phonics Screening Revision Activity - Real/Nonsense words for children to read. Complete Set. This download includes a PDF document with 88 pages. There are 8 words per set (4 real/nonsense) and 44 sets altogether. These include words from past phonics screenings as well as sets organised by grapheme. This can be used as a whole class activity / starter or with 1:1/group interventions. Children could be asked to independently identify the graphemes in a word and record the number in the box next to it. Or this box could be used to identify whether the child read the words correctly. Great revision activity for the upcoming phonics screening. No preparation needed. Simply print and use. There is a large teacher version (a4) as well as pupil versions (9-per-page) for every set to support use in a classroom context. Words contain the following phonemes; ow, oe, oa, ai, ew, ph, th ch, sh, ck, qu Children must look out for alien words and these slides have an alien picture on them. A selection of CVC word worksheets, suitable for Early Years and KS1. 30 pages of phonics activities perfect for practising alien words from phase 2-5 for the Phonics screening check. ❂ 20 NO Prep Printables includes workbook cover page,just print and staple! Reviews and feedback are appreciated, I value all but as we tell our students, try to be constructive! Printing Tip: This educational resource has been designed for printing on A4 size paper. If you are printing on a different size, select ‘shrink’ or ‘print to fit page’ (or similar option) in order for the contents to fit correctly. Purchase of this resource entitles YOU, the buyer, the right to reproduce the pages for personal and classroom use ONLY. Duplication for other classes, an entire school or for commercial use is strictly prohibited without written permission from Polly Puddleduck. Minor editing is allowed but only for personal use. The document remains under the copyright of Polly Puddleduck even when edited. Posting this item in whole or part on the Internet in any form is strictly prohibited and a violation of the Digital Millennium Copyright Act (DMCA). Other phonics related resources can be found in my shop! Two sets of flashcards to get the children used to reading real and nonsense words for the screening in June. These are new words, different to the government issued ones. Each child will be required to read 40 words. It is intended you use either set A or set B as they contain a balance of real / made up words with A1 being easier than A2. Hope that makes sense. Set B is just a repeat of the activity. I made this snakes and ladders type game to help reinforce all the graphemes up to phase 5 as prep for the screening test. Also sneaked in some consonant blends too. I'll use groups of three with my phonics group and enlarge the document to A3. You can change any of the graphemes to meet the needs of your learners. The children in my Phonics group absolutely love a Loop (follow-me) card activity, and with the Phonics screening test coming up, I have prepared a version which includes alien words (many of which are from the last couple of year's tests, including their great alien images, plus a few more). This addresses both blending and segmenting skills, as they have to recognise the first word on their card when spoken, and then read the second word correctly for the next child to recognise. I have a large phonics group, so there are 32 cards, but feel free to reduce for smaller groups. I hope this is useful, and that your classes have as much fun as mine using this activity. I am really excited to show you my first phonics game. ay, ee, igh, ow, long oo, short oo, ar, or, sh, unvoiced th, voiced th, ch and tch. Included are a set of game ideas, although the possibilities really are endless!! Examples include, Phonics snap, Phonics go fish or pairs. These could be used along side your phonics, or as an individual game for children to play during guided reading sessions, or as part of continuous provision. They are a fun way for children to learn, revise and consolidate their sounds. Suitable for all ages and abilities. Using original illustrations from Hannah's Phonics Stories. I will bring out another pack once I have done another 13 sounds!! Feedback warmly welcomed!! Each player has a different set of coloured counters. Each person throws the die and chooses a word from that column. They read the word and cover it with their counter. At the end of the game the person who has the most of their coloured counter on the board is the winner. This is a power point presentation of funny phonics which works with letters and sounds, but can also be adapted to work alongside Letter land and Jolly phonics. These slides focus on ee, ey and revision of phase 3 (ee). 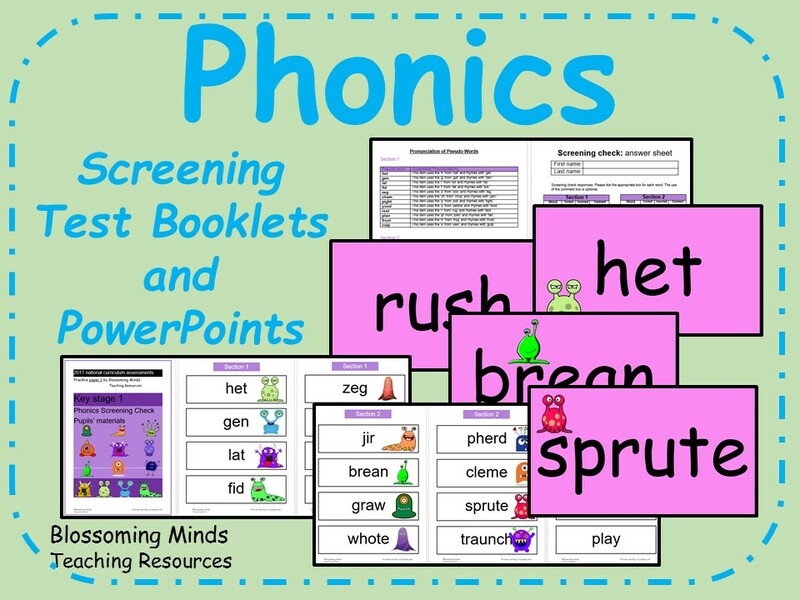 Save yourself HOURS of work with this lovely interactive resource pack providing practice materials for the pseudo words that children will encounter during the year one phonics screening check. The pack contains 2 colourful PowerPoint presentations, 2 sets of printable flash cards, a lesson plan and an activity sheet. The resources would provide a numerous lesson and can be used year on year. The pack focuses solely on the pseudo words as in my experience, these tend to be the words children find most challenging in the check, even for able readers. The materials have been carefully prepared following the principles of the Standards and Testing Agency (STA) screening checks, ensuring a broad coverage of sounds including vowel digraphs and common consonant blends. 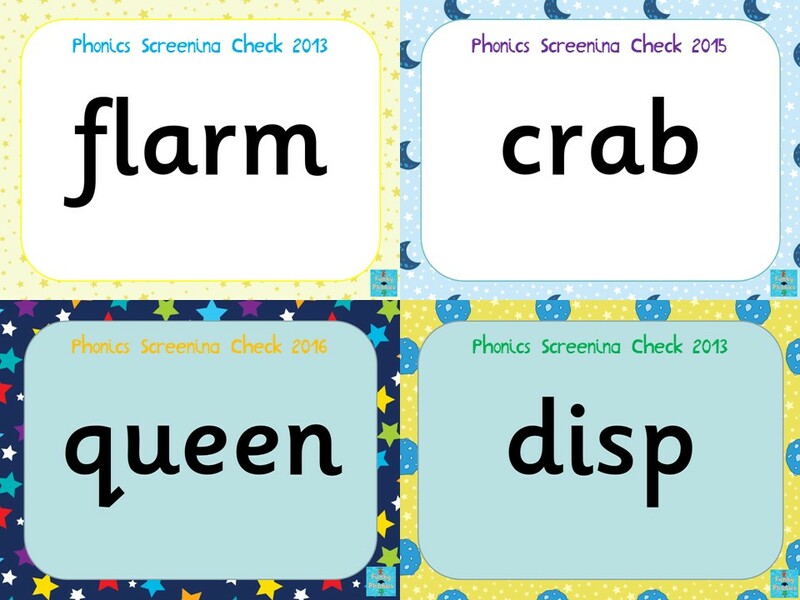 For each of the Phonics Screening Tests there is a word generator. Press s to stop them spinning and enter to carry on. Take a look at our video video to see it in action. Daily Phonics revisit and practise. Slides to use daily to recap previously taught phonemes. There are 34 slides within each presentation. Pupils to read graphemes, real words and pseudo/Monster words. 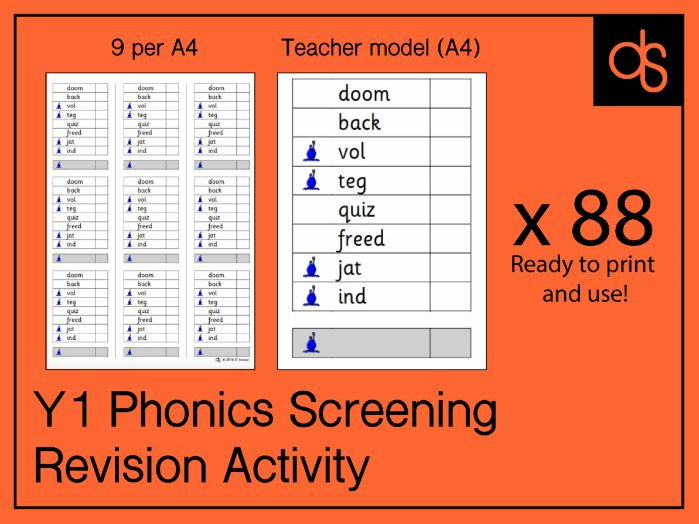 Words used are mainly from the 2013, 2014, 2015, 2016 and 2017 Phonics Screening Checks.